They don’t always say what they really think. Sometimes their message is hidden “between the lines”. And sometimes verbal interventions are done. But always their opinion deserves to be heard! – Nobody know how it will with cryptocurrency in short term. I’m a fundamental investor, I invest in fundamentals. Long term the future is brighter than ever for crypto and Bitcoin Cash specifically… We need more cryptocurrency adaptation worldwide. Need to build economy using cryptos as actual currencies. We need to build tools to make it easy for people to use cryptocurrencies – to buy and sell, and pay the bills, pay the rent and even pay their taxes – governments should accept bitcoin for taxes. 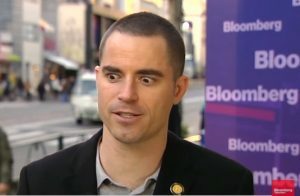 Roger Ver fond of paying taxes? It inspires! 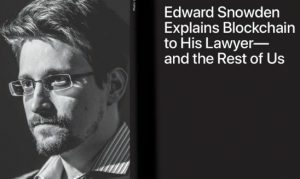 – My deepest thanks to the US government, Senator McCain and Senator Lieberman for pushing Visa, MasterCard, Payal, AmEx, Mooneybookers, et al, into erecting an illegal banking blockade against WikiLeaks starting in 2010. It caused us to invest in Bitcoin with > 50000% return. The U.S. government forced payment companies like Visa and MasterCard to carry out “an illegal banking blockade” against WikiLeaks. In 2010, MasterCard blocked its products being used to pay WikiLeaks. Paypal also restricted the account used by WikiLeaks. Assange said that he has made a 50,000 percent return, presumably investing in bitcoin over the six-year period. 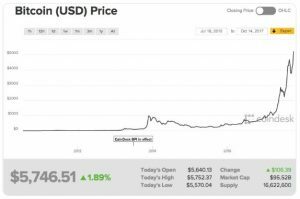 Bitcoin prices on July 18, 2010 was $0.06 and on October 14, 2017 – $5,814. This represents a 9,689,900 percent increase. 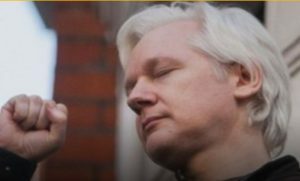 There are rumors that Assange is backing bitcoin now. – Blockchains can theoretically be applied in many ways, but it’s important to understand that mechanically, we’re discussing a very, very simple concept, and therefore the applications are all variations on a single theme: verifiable accounting… There is no takedown mechanism or other “let’s be evil” button, and creating one requires a global consensus of, generally, at least 51 percent of the network in support of changing the rule. – What makes a little piece of green paper worth anything? Why is gold worth so much more than its limited but real practical uses in industry? Because people generally agree it’s worth more than its practical value. That’s really it… Blockchain-based cryptocurrencies like Bitcoin have very limited fundamental value: at most, it’s a token that lets you save data into the blocks of their respective blockchains, forcing everybody participating in that blockchain to keep a copy of it for you. But the scarcity of at least some cryptocurrencies is very real… The only thing that gives cryptocurrencies value is the belief of a large population in their usefulness as a means of exchange … As long as there are people out there who want to be able to move money without banks, cryptocurrencies are likely to be valued. Well-well-well! Are they disappeared – such people? And does all these men with sky high IQ wrong? You serious?